Vinyl [Freeware], Lo-Fi from iZotope. 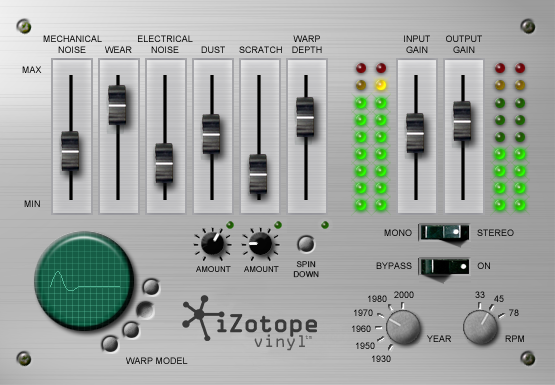 To celebrate the company's 15th Birthday, iZotope have released a 64-bit version of their free Vinyl plug-in, also adding AAX&VST3 support on the way. The new version of Vinyl has been updated to support modern operating systems and audio editing software: the plug-in is now 64-bit compatible on both Mac and PC, and supported formats now include AAX and VST3. Vinyl also features a new Spin Down button that simulates slowly stopping playback of a record, with announced results ranging from a dramatic "record stop" to a subtler nuance on an individual instrument. Vinyl's classic features are meant to allow a user to simulate the dust, scratches, crackles, pops, and warping of a worn record as well as the mechanical noises of a turntable. In addition, the Warp features are now available for use in all supported plug-in formats. Vinyl is available now for free from the iZotope website. Customers who have downloaded previous versions of Vinyl shall receive their free update details via email and within their iZotope Account. Wavesfactory announces Demonic Virtuoso Wavesfactory has announced Demonic Virtuoso, which will be an updated version of the brand's W-Harpsichord. Toontrack releases Country Guitars EZmix Pack 24 hours after inaugurating their Country Month, Toontrack has released an electric guitar dedicated EZMix pack revolving around the genre. Eventide releases Octavox as a separate plugin Already part of Eventide's Anthology X bundle, the Octavox harmonizer is now available on its own - and at a special launching price.